FIGURE 16-9 Proposed mechanism for the inactivation of the cyclooxygenase component of prostaglandin endoperoxide synthesis by aspirin. Reproduced with permission from Gurr, M. I., and Harwood, J. L. (1991). "Lipid Biochemistry, An Introduction," 4th ed., p. 104, Chapman and Hall, London. 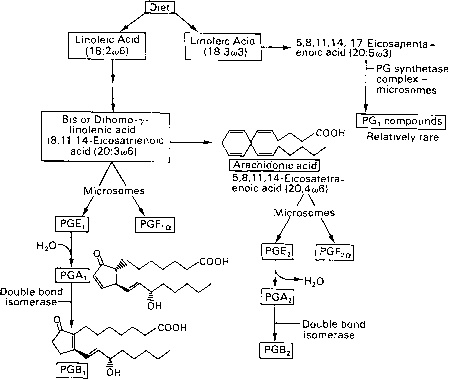 FIGURE 16-10 Overview of the biosynthesis of abundant and less abundant PGs. transcortin, the circulating level of free Cortisol is increased sharply. This leads to a marked decrease in placental production of progesterone and a stimulation of estradiol synthesis, PGF2a synthesis, and oxytocin release, all of which bring about contractions of the uterus to expel the fetus. PGF2a has been used as an agent for therapeutic abortion by intraamniotic injection, sometimes in combination with oxytocin. The uterine myometrium appears to contain PGF2„ receptors. The interaction of PGF2a with receptor generates muscular contraction through increased levels of Ca2+ in the cytoplasm. This is expected to occur by the stimulation of phosphatidylinositol metabolism and the generation of IP3. PGE analogues are often used during late first and early second trimester pregnancies before vacuum aspiration. Combination of prostaglandin with an antiprogestin can lower the effective concentration of prostaglandin, thus lowering gastrointestinal side effects and uterine pain.